10 NFR qualifications, 3 Calgary Stampede Championships, a Reserve World Championship, a Canadian Championship and winnings of more than $850 thousand dollars . . . all attributable to one family. What does it take to create this kind of family tradition of winning? This video answers that question. Youâ€™ll meet Molly Powell and her mother Julie Swanson in this video, and they will show you how theyâ€™ve created and maintained a family tradition of success. In this video, Molly talks extensively about bit selection and how each of the bits in her new line by Reinsman fit into her training and competition program. Molly will explain how the different mouth pieces affect horses in the turns, and will tell you how you can get the same bits that she ran Pecan and Shadow in at the NFR. Molly also discusses her new Coats saddle design, and how the flexible bars are beneficial to her horses in the pattern. 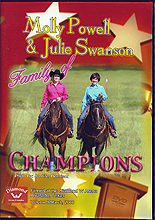 Julie trains and seasons all of Mollyâ€™s rodeo horses, and she is also featured in this video. Julie discusses rodeo prospect selection, and how it differs from the selection of a futurity prospect. Julies training program is highlighted and she discusses several topics and demonstrates several key concepts. Fundamental skills, pattern work, rate points, body positioning for both the horse and rider and collection in the turns are just some of the topics that Julie discusses. In addition to these core concepts that you would typically expect from a Winning Runs video, Julie also addresses the different training philosophies needed to train different horses, and youâ€™ll hear her talk about issues specific to a harder to train horse. This video is suitable for intermediate to advanced riders, as some of the concepts and exercises do require some previous knowledge, and at least average riding ability. The exercises presented here are suitable for horses with a basic riding foundation. The video addresses the importance of quality tack selection, body and hand positioning in the pattern, and the specific style needed to train a horse for rodeo competition. In addition to Julieâ€™s sound training advice, Molly illustrates several key concepts from her own video series. Specifically, she talks about warming up a laid back horse and how to get and energetic warm up to translate into the pattern. Molly also demonstrates exercises that she uses to ensure that her horses are working sound and listening to her cues before a run. From the tack trailer to the practice pen, and from the practice pen to the competition arena . . . Molly and Julie will help you to get and keep your horse â€œPeaked Outâ€� and to make that winning run! As an added bonus, the Winning Tips feature with Charlotte Cunningham addresses perfect body positioning for your horse as he approaches and works through the turns. She provides you with numerous tips and exercises to use in teaching and perfecting the pattern. Video approx. 1hr 17 mins.